You may have seen strage looking green orbs in a green or brown husk in the grocery store and asked yourself what are those and what do I do with them? Those are tomatillos and they are great for salsa verde. They are a native of Mexico and have been used in their cuisine for hundreds of years. 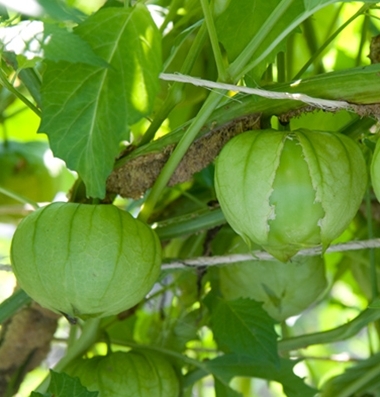 Tomatillos are related to tomatoes and can grow any place where tomatoes can grow. Toma Verde can grow in a wide variety of climates and can withstand more dry conditions. They can also take a bit more heat than tomatoes. Toma Verde Tomatillos produce 2-4 ounce fruit that are medium green when ripe in a brownish paper husk. They are a little bit bigger than cherry tomatoes. They have a sweet, tangy flavor and are used in a variety of Mexican dishes. If left on the vine and they turn more yellow, they lose their unique flavor. Outstanding Features: Can be stored in their husks for up to two weeks in a paper bag in the refrigerator or 3 months out of their husks. They can also be frozen or canned like a regular tomato. Tips: Avoid watering from the top to help prevent any foliar disease. Drip irrigation is recommended or if you must water from the top make sure you do it earlier in the day so that the foliage can dry out before nightfall. Click here to buy Tomatillo Toma Verde direct from www.buygardenvegetables.com.